Varisia’s newest heroes have stumbled across a powerful relic from the ancient empire of Thassilon—yet the artifact has been sundered into seven fragments. The third of these fragments lies in the swampy Mushfens south of the city of Magnimar, hidden within an ancient, towering lighthouse known as the Lady’s Light. With squabbling boggards, troglodytes, and other swamp monsters dwelling around the ruins, approaching the Light will require either stealth or bravado. But the threats posed by slimy and scaly humanoids pale in comparison to the exiled Gray Maidens who have claimed the interior of the Light as their new headquarters, or to the sinister curse that afflicts the powerful, ancient caretaker of the ruin. 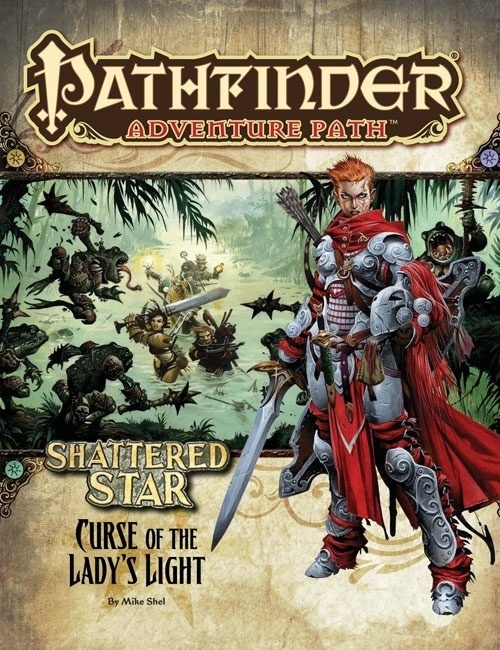 Curse of the Lady’s Light, a Pathfinder RPG adventure for 5th-level characters, by Mike Shel. The sadistic secrets of the Gray Maidens, a militaristic order once fiercely loyal to an evil, deposed queen, by F. Wesley Schneider. The secret ways, peerless techniques, and ancient traditions of Torag, stern god of the forge, protection, and strategy, by Sean K Reynolds. Alchemy and housebreaking in the Pathfinder’s Journal, by Bill Ward. Four new monsters, by Levi Miles, Sean K Reynolds, and Mike Shel.